Ogrod bears no resemblance to the composite police sketch based on eyewitness accounts of the man carrying the box, and there is no physical evidence linking him to the crime. His conviction was based solely on a confession he signed after thirty-six hours without sleep. "They said I could go home if I signed it," Ogrod told his brother from the jailhouse. The case was so weak that the jury voted unanimously to acquit him, but at the last second-in a dramatic courtroom declaration-one juror changed his mind. As he waited for a retrial, Ogrod's fate was sealed when a notorious jailhouse snitch was planted in his cell block and supplied the prosecution with a second supposed confession. 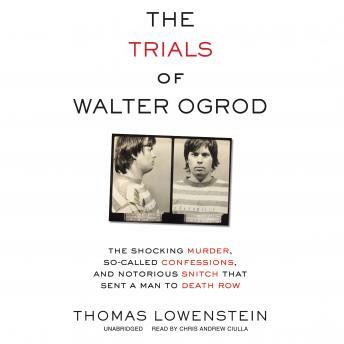 As a result, Walter Ogrod sits on death row for the murder today. Informed by police records, court transcripts, interviews, letters, journals, and more, award-winning journalist Thomas Lowenstein leads readers through the facts of the infamous Horn murder case in compelling, compassionate, and riveting fashion. He reveals explosive new evidence that points to a condemned man's innocence and exposes a larger underlying pattern of prosecutorial misconduct in Philadelphia.